“The Redeyes” is a science fiction story of redemption and salvation, about a convicted felon who discovers the means to freedom for a group of survivors—if he can only convince them to listen to him. This ebook (free at certain retailers) also contains the first chapter of the author’s debut novel, Father John VS the Zombies. 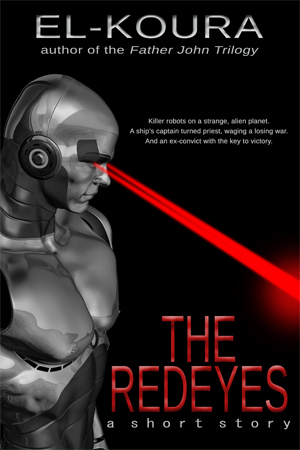 The ebook of “The Redeyes” is currently available for purchase at Amazon.com and Amazon.co.uk . “The Redeyes” was originally published in MindFlights Science Fiction & Fantasy.